Save up to 70% on timeshare resales and rentals at Eagle's Nest Beach Resort in Marco Island. Find your spot in paradise today. What’s My Eagle's Nest Beach Resort Timeshare Worth? 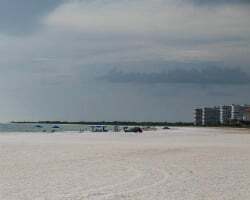 Marco Island was constructed to provide a paradise for vacationers to enjoy, offering endless sun, sand, and things to do around Florida's Gulf Coast. The Eagle's Nest Beach Resort echoes this sentiment, providing its guests with a one-of-a-kind experience that can be enjoyed each and every year with its luxury timeshare accommodations. The resort's location right on the western edge of the island provides direct access to the beach, a must-have for any guest of Marco Island. It also places its guests in the immediate area of unique eateries and beachside bars that will immerse each and every individual in the remarkable island lifestyle. The resort itself combines seamless efficiency with convenient services and amenities to provide you with a fun and comfortable stay while on your trip. Spacious one and two bedroom suites at the property often come with screened balconies and unparalleled views of the Gulf of Mexico, and come equipped with all the in-room amenities you need to feel right at home. Perfect for families and anyone seeking a quiet escape into paradise, the Eagle's Nest Resort has something special in store for everyone. Are you ready to find your own tropical home-away-from-home? Explore the timeshare resale and rental advertisements at the Eagle's Nest Resort Marco Island with SellMyTimeshareNow.com. Fill out the form on this page or call a representative directly at 1-877-815-4227 for more information. What if we told you that you can find luxurious ownership accommodations at the Eagle's Nest resort for thousands less than most people spend? Fortunately, timeshare resales provide that exact opportunity, along with so much more. 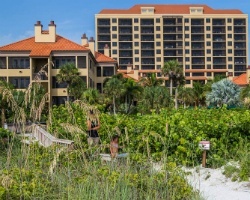 You can find amazing beachside accommodations at this Marco Island resort for prices up to 70% lower than retail value when you purchase a for-sale-by-owner timeshare. What's more, your Eagle's Nest timeshare resale could be your ticket to a whole new world of vacationing. With deeded and floating weeks, as well as points-based ownership available on the resale market, you have no shortage of options when shopping for a timeshare. You can find the accommodations and the ownership interval that works best for you, according to your vacation preferences. Resales at the Eagle's Nest are affiliated with the Hilton Grand Vacations Club, and are available during Hilton's Silver, Gold, and Platinum seasons. Resale owners will also be enrolled in HHonors, Hilton's rewards program. Being a Hilton Grand Vacations Club-affiliated resort means a few things, the most important of which being the ultimate convenience in vacation planning. Thanks to very few restrictions toward secondary market buyers, your timeshare resale will allow you to start using HGVC points to make reservations at the Eagle's Nest immediately. You'll also be able to take advantage of some of the ownership benefits offered by Hilton, such as banking and borrowing points and exchanging your timeshare internally for stays at other Hilton resorts. The Eagle's Nest Marco Island is affiliated with RCI, the world's largest timeshare exchange company. Noted for its massive directory of more than 7,000 affiliated properties, RCI provides timeshare owners with a ticket to exploring the entire globe. An RCI membership can allow you to deposit your week or points at the Eagle's Nest resort in exchange for stays at similar resorts in other destinations. The Eagle's Nest is also an RCI Gold Crown resort, meaning it maintains a standard of excellence among previous guests. This distinction means that there is likely a high demand for owners at other resorts seeking to stay there, giving you more trading power. The Hilton Eagle's Nest incorporates a wide range of impressive on-site amenities to make your stay comfortable and enjoyable. Relax by the heated swimming pool or nearby whirlpool spas to unwind in the sun, or head down to Crescent Beach to swim and sunbathe. 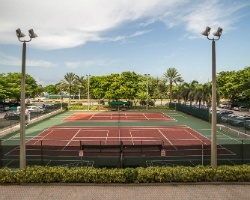 The resort's two lighted tennis courts are perfect for staying on top of your game, while the supervised kid's activities and free on-site parking are there for your convenience. Book an island cruise or private cabana along the Gulf of Mexico to cap off your trip in style. The area surrounding the resort is full of things to do and see. Some of the region's best golf courses, like Hammock Bay Golf & Country Club, are located just a short drive away. On the northern side of the island, eateries like Arturo's Ristorante Italiano and Crazy Flamingo provide unique fare that is guaranteed to give your taste buds a vacation of their own. Don't forget to rent kayaks to paddle through the island's waterways, or charter sailing lessons and deep sea fishing excursions to get the full Marco Island experience! Already Own at HGVC Eagle's Nest Beach Resort?